We’d love your help. Let us know what’s wrong with this preview of The Empty City by Erin Hunter. The time has come for dogs to rule the wild. Lucky is a golden-haired mutt with a nose for survival. He has always been a loner—roaming the streets of the busy city and relying on his instincts to get by. Other dogs have Packs, but Lucky doesn't long for the days he spent with his littermates. He stands alone. Then the Big Growl strikes. Suddenly the ground is split wide o The time has come for dogs to rule the wild. Then the Big Growl strikes. Suddenly the ground is split wide open. The Trap House is destroyed. And all the longpaws have disappeared. To ask other readers questions about The Empty City, please sign up. is it a really good book? Brianna This is the best book in the history of any book ever made. So.....yes. I would say worth reading. 12 times. Over and over again. y can i not read it? Lucky, really? The dog's name is Lucky. Very original. *sigh* I hope this isn't like a repeat of Warriors and Seekers, just with new names for things like monster and firebeast. And continuously talking about how empty the dog's belly is. The cover does look awesome, though. Oh, but you know what would be really awesome? If it crossed over with Warriors or Seekers! Not directly, of course. But if at one point they said something about seeing a flame-colored cat or something like that. Maybe have o Lucky, really? The dog's name is Lucky. Very original. *sigh* I hope this isn't like a repeat of Warriors and Seekers, just with new names for things like monster and firebeast. And continuously talking about how empty the dog's belly is. Ugh. I wanted to hate this book. I wanted to hate this book soooo badly, but I ended up loving it. First off, let me just explain to you why I so desperately wanted to hate it! Okay, so Survivors is the new series written by "Erin Hunter". Why the quotation marks you ask? Well the original four Erins have nothing to do with it! This pisses me off. Yes--HarperCollins does have rights to the name "Erin Hunter" but the truth is that the four Hunters have worked hard to earn their title. They were go Ugh. I wanted to hate this book. I wanted to hate this book soooo badly, but I ended up loving it. First off, let me just explain to you why I so desperately wanted to hate it! Okay, so Survivors is the new series written by "Erin Hunter". Why the quotation marks you ask? Well the original four Erins have nothing to do with it! This pisses me off. Yes--HarperCollins does have rights to the name "Erin Hunter" but the truth is that the four Hunters have worked hard to earn their title. They were going to stop Warriors after The Last Hope but HarperCollins forced them to write the fifth series Dawn of the Clans. Now, Survivors is written by these "fake" Erins. On forums.warrriorcats.com, there was a vote for the cover of Survivors - Book 1: The Empty City. I am glad that the cover was in a different format than the Warriors and Seekers books. These books do not say "Erin Hunter" anywhere. And yes, I know, Erin Hunter is on the cover for the author, but it is NOT ERIN STYLE AT ALL! 1. The Prologue. Yes there are prologues in the Warriors but not the Seekers series. However, one tell-tale Erin Hunter trait is that she never names the characters unless another character says their name. The first sentence is: "Yap wriggled, yawning, and gave a small excited whimper." In true Erin Hunter style, they would have said: "A small, newborn puppy..." or something like that. 2. The format. These books are double-spaced. When novels are double-spaced it screams either children's books or laziness. Yes, this is a children's novel to some extent, but teens and young adults read these books too. I am living proof of that. These books are in the Children's section, yes, but they are written like novels you would find on the #1 Bestseller list... Well Warriors and Seekers were. I haven't read Survivors yet, but I am skeptical. 3. The cover. I know that it was voted to be different which I am glad for. However, if HarperCollins truly wanted it to look "Erin Hunter"-like, they would have kept to the style of the other series. By doing this and hiring new writers and forcing authors to write more because they own their combined name is just selfish. They just want money and they have basically said that the four Erins are replaceable. This is outrage. Some people might not care who writes the books, but I do. I am going to read Survivors, but I will never look at HarperCollins the same way again, and will never have respect for them. Okay, so, yes, I was well prepared to nit-pick the s**t out of this book because I was so pissed off at HarperCollins... However, I loved the story. So The Empty City is about when an earthquake (I think) ends up destroying a city. All of the people have apparently died off from injury, radiation, disease, or have fled, many leaving their dogs behind. Lucky was in a Trap House, which I guess is comparable to an animal control kennel, or something like that, when the "Big Growl" strikes. Lucky's cage toppels over and he and his friend Sweet escape the Trap House. The pair set off into the city and try to fend for themselves. Lucky is what they call a "Lone Dog". He survives on his own and doesn't need to rely on anyone, and doesn't want anyone to rely on him. Sweet, however, is not like that. She is a Pack Dog through and through and ends up leaving Lucky to find a pack. Lucky then faces a series of challenges trying to survive on his own in the city until he nearly gets attacked by a pack of foxes. Just when all hope seems to be lost, however, Lucky's litter-sister, Bella (formerly Squeak) and her Pack come to the rescue. Lucky, however, soon ends up realizing that Bella and her Pack are Leashed Dogs, or pets. They are waiting for their longpaws (humans) to return to them, even though it is clear that they have left. After some thorough convincing and some frightening events, Lucky leads the strange Pack into the wilderness and teach them to survive on their own. Honestly, I really did not hate this book. I was so prepared to, but just couldn't. The characters were well-structed and I liked the little sibling-rivalry between Lucky and Bella. I have my own opinions about Bella, but I won't bore you with my rants since I've already seemed to have ranted enough in this review. I liked that the author made each character have a unique talent that helped them out in the long run, and they were all able to work together. I didn't like the ending though. I hate cliff-hangers especially when he have to wait a year for the sequel. :( But, I can't say anything worse about it than I already have. All of my gripes are with HarperCollins, not the author herself. This review contains spoilers after the first paragraph. You are forewarned. I am a huge fan of the Warrior series so I was crazy excited to get an advanced reader's copy of this book. Now I really wish I hadn't picked it up. You'll find a similar cosmology structure to the other Erin Hunter books, which would make more sense if dogs hadn't lived so closely with us for thousands of years. If Hunter had chosen to write about wolves this book would've made a lot more sense. For the story to work f This review contains spoilers after the first paragraph. You are forewarned. So either a huge quake, radiation, or a plague killed off humans (or a combination thereof). Our hero is "Lucky" the generically named dog. Dogs are separated into feral groups who look down on "leshdogs" in the same manner that the Warriors looked down on "kitty-pets" which would make sense, again, if dogs hadn't left wolves to be with us. Strangely, none of the humans left care about these "wild" dogs, and yes, that is strange, Hurricane Katrina showed us the truth of Temple Gradin's statement, animals make us human. I feel this writing very much discredits the vast amount of rescue work done in terrible times to save our furry family members. But, okay, lets pretend that for some reason the plague/radiation/earthquake changed US so vastly. One of the characters is a border collie, a breed known for its wide vocabulary, and if the dogs know what a Vet is, they should know to call a car a car and not a loud cage. Its confusing for an adult, I can't imagine a kid would find it much better. By the end of the book you just hate yourself for being a human, because you are keeping these dogs from their "true" selves (which I guess is not wolves for some reason). The writing is sloppy to say the best, I feel like Hunter just injected cat thinking into dogs. Since I've worked with dogs I can definitively say that even a family dog "works" for a living in its own way. I became very tired of Lucky's narrative about how useless everyone was (in spite of showing Lucky regularly begging at the human soup line), but him and how detached everyone was from the "true" dog religion. I didn't have a problem with the cosmology of previous Hunter works because in spite of living with us for thousands of years too, cats kinda do their own thing, dogs are less inclined to be independent from their human pack. Overall it seemed like Hunter couldn't make up her mind if dogs should be devoted as we've known them to be, or callous. Lucky eventually finds his new pack useful and decides to help them, (I guess because his sister was in the pack? He got lonely? His motives were very murky, again writing problems). Enjoying it way more than the first time I read it. I love Erin's "Warriors" series, but this one has been a disappointment. While the warriors one feels full of ancestry and wisdow this one feels childish and puts the dogs in a frame of mind where they feel very childlike and somewhat stupid. And I love cats and dogs, and found this one a bit offensive and couldn't make meet end in any way... those weren't dogs, that's for sure! This book is awesome!!!!! Go Erin Hunter! This was an amazing new series starter! I am so glad that Hunter finally got approval from her publishing company to start writing about dogs. The language and symbolism she uses to portray dogs is spot on, and I love Lucky as the main character! He's such a complex and deep character, I can't wait to see him unfold, as we did Firestar in the Warriors series! Hello! This a SURVIORS fan page! This. Is. Surviors. Not. Warriors. Alpha # 1 : Open! Alpha # 2 : Open! Thanks! ( For joining). Hope ya have fun! There are many similarities between The Empty City and Bobbie Pyron's The Dogs of Winter though one involves children and dogs attempting to survive in Russia and the other involves dogs trying to survive after a cataclysmic event without their Longpaws (masters). Erin Hunter is a master at enabling us to see the world through the minds of the dogs. Hunter's books are probably the most popular in our Junior High School Library. The Warriors, novels. 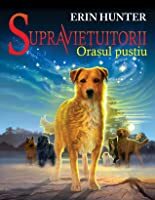 based on cats, are trilogies and once the stude There are many similarities between The Empty City and Bobbie Pyron's The Dogs of Winter though one involves children and dogs attempting to survive in Russia and the other involves dogs trying to survive after a cataclysmic event without their Longpaws (masters). Erin Hunter is a master at enabling us to see the world through the minds of the dogs. Hunter's books are probably the most popular in our Junior High School Library. The Warriors, novels. based on cats, are trilogies and once the students get hooked on the first book of any set, they can't wait to read not only the next book in that trilogy but all of the other series as well. 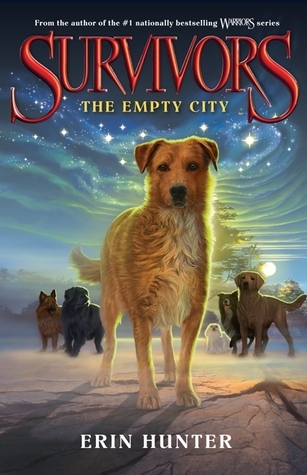 I am certain that the "Survivors" trilogy which is based on dogs will be a favorite, too. This tale of survival involves many harrowing situations but there is always a spirit of faith involved as Lucky, the Lone-Dog, attempts to lead, train, and protect his band of Leash-Dogs who were once pets. Earth-Dog, Sky-Dog, and Forest-Dog made me feel as though I were reading something from Indian lore. I was fascinated by the crow that seemed to appear when situations were dire. I look forward to the development of this mysterious character in the novels yet to be released. I was satisfied reading this as a stand-alone novel but must admit that Hunter has tweaked my interest in reading the sequels. I wish they chose the other cover. It was much better. I hope this will be just as good as the Warriors books, even though the Erin Hunters writing it are different! As all of the Erin Hunter books, this one was fantastic. While the Warrior series is still my favorite Erin Hunter series, I enjoyed this one as well. This was my second time reading it, which was just as good as the first. I am hoping to get back into this series. I hope I can catch up soon. I am excited to actually read the second book this time! This book was pretty good. It is not as good as the first book of The Last Dogs, ( both books about dogs in an apocalypse) but good enough for a four star rating. Lykky-niminen koira on kuullut pennusta asti tarinoita myyttisestä Koiramyrskystä, jonka paluu merkitsee sitä että koirat joutuvat jälleen kerran taistelemaan olemassaolostaan. Legenda vaikuttaa muuttuvan eräänä päivänä todeksi, kun Suuri Murahdus (eli toisin sanoen maanjäristys) pistää kaupungin uuteen uskoon ja tuhoaa maailman sellaisena kuin koirat sen tunsivat. Nyt eivät enää entiset toimintamallit olekaan voimassa. Lykky kohtaa joukon isäntäperheistään eksyneitä koiria, joista yksi on hänen Lykky-niminen koira on kuullut pennusta asti tarinoita myyttisestä Koiramyrskystä, jonka paluu merkitsee sitä että koirat joutuvat jälleen kerran taistelemaan olemassaolostaan. Legenda vaikuttaa muuttuvan eräänä päivänä todeksi, kun Suuri Murahdus (eli toisin sanoen maanjäristys) pistää kaupungin uuteen uskoon ja tuhoaa maailman sellaisena kuin koirat sen tunsivat. Nyt eivät enää entiset toimintamallit olekaan voimassa. Lykky kohtaa joukon isäntäperheistään eksyneitä koiria, joista yksi on hänen sisarensa. Vaikka koirat vaikuttavat melko toivottomilta luontokappaleilta voidakseen selviytyä muuttuneissa olosuhteissa, liittyy Lykky kuitenkin laumaan. Yhdessä yritetään sitten tulla toimeen, vaikka pääkoiruutemme vannoo mielessään jättävänsä muut taakseen heti ensi tilassa. "Autio kaupunki" (Jalava, 2014) on Erin Hunter -salanimen taakse kätkeytyvän kirjailijajoukon uuden Selviytyjät-kirjasarjan ensimmäinen osa. Lukijalle tarjoillaan melko perusvarmaa ja yllätyksetöntä eläinseikkailua, jossa on kuultavissa kaikuja niin Soturikissoista kuin Etsijöistä: eläimet opettelevat selviytymään uusissa olosuhteissa, joutuvat erilaisiin vaarallisiin tilanteisiin, kertovat omia legendojaan, käyttävät ihmisten maailman jutuista paremmin omaan suuhunsa sopivia nimityksiä ("melukeppi", "pitkätassu") ja niin edelleen. En itse pitänyt tästä postapokalyptisesta koiratarinasta yhtä paljon kuin kissa- ja karhukirjoista, mutta uskoisin lapsilukijoiden tästä tykkäävän. Sarja uponnee parhaiten viitos-seiskaluokkalaisten kohderyhmään. Se, onko kirja missä määrin fantasiaa, on sitten oman keskustelunsa väärti. Fans of Warriors Will either be absolutely delighted with Survivors, or they will hate it with a burning passion. Well, maybe not that intense, but they won't like it. Fierce Dogs: Bloodclan/Shadowclan/any cats giving Thunderclan a hard time. The Erin Hunters are definitely sticking to what they know best, but I think that's a good thing. However, I find it strange that they went right from cats to dogs. Hello, Bluestar's death? And now I can't like cats in this series! Good thing I'm both a cat and a dog person. The Empty City is still pretty original, and it has a bit of dystopian in it as well....kind of. It's not honest-to-goodness dystopian, but it was still cool. And I found myself liking Lucky a lot; his personality is much different than Firestar's. Still, I don't think it lived up to Warriors, which disappointed me. It did beat Seekers, though. I have read this book before and I decided to read it again. I forgot how sad it was. Survivors is a series that will keep you on your toes. If you enjoy any of the Erin Hunter series then this is a must read. It has the classic Erin Hunter style, with benign in the place of an animal, and this book is about Lucky and his journey through a abandoned city after an earthquake. Lucky meets old friends, and makes new ones along the while, and makes plenty of enemies as well. Through the book we see Lucky battle with his feelings of wanting to be a lone dog, or part of a pack. As he m Survivors is a series that will keep you on your toes. If you enjoy any of the Erin Hunter series then this is a must read. It has the classic Erin Hunter style, with benign in the place of an animal, and this book is about Lucky and his journey through a abandoned city after an earthquake. Lucky meets old friends, and makes new ones along the while, and makes plenty of enemies as well. Through the book we see Lucky battle with his feelings of wanting to be a lone dog, or part of a pack. As he meets new dogs he wants to leave, but keeps staying because he feels the need to show them to survive without their owners. But we really know this is because he's lonely and wants to be with a pack. When you begin reading this book you may find it odd that you in some ways can relate to these dogs, for me I understood Lucky inner battle. Wanting to be apart of groups yet wanting to remain as a "loner", because groups attract "dangers". In this book however, you can see and understand each dogs personality and relate to the characters, despite them being dogs. Our canine friends seem more human in this series and it really makes the book so much better. This book starts out by throwing action right at you, an earthquake. Lucky is in an animal shelter, where he escapes, and the journey begins. He meets Sweet, a greyhound who tells him that she's a pack dog, and he should come with her. This Is where we find out Lucky is a lone street dog and wants noting to do with a pack, but he can't help himself when he gets attached to her. When she leaves Lucky is on his own again, and goes back to scavenging, and he's confused about his loneliness. Lucky enters a mall, where he meets his friends, Old Hunter, who tells lucky its everyman for themselves. However, Lucky meets his future pack when a band of foxes attack him and the group of dogs save him. This pack is a group of human owned dogs who refuse to believe that their masters left them behind. Lucky teaches them that humans wait for no one, and he brings them to the wild after a dangerous incident occurs in the packs old neighborhood. The human owned dogs carry items of their masters, which Lucky doesn't believe in. Soon enough Lucky teaches them the way of a pack, and tells them to trust their inner dog spirit, hoping he can teach them to survive and then leave and go back to being a lone dog. Lucky realizes he's getting attached after he saves the pack from other dogs, he realizes that he doesn't want to leave, so he does just that. He leaves after telling the pack he taught them everything he knowns and he's done. However when leaving Lucky senses something and attempts to return, but the book ends there. Erin Hunter is an amazing author(s), in my eyes she's know for leaving the reader on a cliff hanger and wanting more. She manages the give these animals so many emotions and thoughts that its hard not wanting more from her. She creates this world through a dogs eyes, and changes words that would make sense to a dog but not a human. These books are the BEST! If you love animals , especially dogs , you should read this book series!It is about a dog named Lucky and a pack of dogs! it is an AMAZING! If you cant handle death or disaster maybe you should pass on this one, but if that is ok with you you should read these books! Erin Hunter ist bekannt dafür Geschichten zu schreiben, in denen Tiere die Hauptrollen spielen. Ich war am Anfang sehr skeptisch und konnte mir nicht vorstellen das mir sowas gefallen könnte, aber vor allem habe ich mich gefragt, wie schreibt man eine Geschichte in der Tiere die Hauptrolle haben? Was genau kann man da überhaupt schreiben? Dann habe ich mich an die Warrior Cats Reihe gewagt und war begeistert. Deswegen war ich auch so begeistert als ich erfahren habe das die Autorin auch eine Rei Erin Hunter ist bekannt dafür Geschichten zu schreiben, in denen Tiere die Hauptrollen spielen. Ich war am Anfang sehr skeptisch und konnte mir nicht vorstellen das mir sowas gefallen könnte, aber vor allem habe ich mich gefragt, wie schreibt man eine Geschichte in der Tiere die Hauptrolle haben? Was genau kann man da überhaupt schreiben? Dann habe ich mich an die Warrior Cats Reihe gewagt und war begeistert. Deswegen war ich auch so begeistert als ich erfahren habe das die Autorin auch eine Reihe über Hunde geschrieben hat und als ich das Buch bei Tauschticket gefunden habe, habe ich sofort zugeschlagen. Nun finde ich zwar den Namen Lucky für den Protagonist nicht sonderlich einfallsreich (mal im Ernst, ein Hund der Lucky heißt…. langweiliger gehts doch kaum! ), aber ansonsten hat mir die Geschichte wahnsinnig gut gefallen. Lucky ist ein Straßenhund, ein Einzelgänger der für sich selbst sorgt und kein Interesse daran hat zu einem Rudel zu gehören. Als eines Tages jedoch ein schreckliches Erdbeben die Stadt in der Lucky wohnt völlig verwüstet und die Menschen von jetzt auf nachher verschwinden, findet sich Lucky in einer Welt wieder die sich sehr von der vorherigen unterscheidet. Die alten Regeln gelten nicht mehr und bald sieht sich Lucky einigen Leinenhunden gegenüber, die ohne ihn nicht überleben würden. Survivors is a mostly delightful read, though rather insubstantial. It tries to be just what it sounds like: Warriors , but with dogs. On that front, it falls rather flat. Natural elements are personified; earth is Earth-dog, a sort of living, breathing deity, a contrast to Starclan in Warriors , but they don’t seem to have any real attachment to these ideals like in Warriors, except when hoping another earthquake doesn’t strike (aka an earth growl), or fondly remembering stories at their mother Survivors is a mostly delightful read, though rather insubstantial. It tries to be just what it sounds like: Warriors , but with dogs. On that front, it falls rather flat. Natural elements are personified; earth is Earth-dog, a sort of living, breathing deity, a contrast to Starclan in Warriors , but they don’t seem to have any real attachment to these ideals like in Warriors, except when hoping another earthquake doesn’t strike (aka an earth growl), or fondly remembering stories at their mothers bellies. But anyway, these are basically the worst things of the book, I would recommend borrowing this before buying, or buying this book secondhand. This was a cute book, and I’ll most likely read the rest of the series, but it’s not a book I would read twice. The interactions between Lucky and the leashed dogs are probably the most interesting part of the story. They have different upbringing and different views, which clash so often. Lucky had always been a stray who keeps to himself and never cares about anyone but himself, so for him having anything to do with humans is unnatural. But other dogs, especially Mickey, are different. They are loyal to their humans and would never ever think about abandoning them, they would wait and wait for them to come back, they would never betray their humans. Because that's what dogs do. Lucky is initially biased towards the leashed dogs, and so not quite likable in my eyes. Bella is too bossy for my liking as well, but the rest of the leashed dogs are a delight to read about. Mickey and Daisy are definitely my favourites. Mickey is the most loyal to the longpaws and very helpful and nice, and Daisy is such an endless ball of energy that it's hard not to love her. The Time has come for DOGS to rule the wilderness! But Lucky is int ready to fight for it Alone....... BBE! best book ever! love Erin hunters new dog take on the world. Written in a dogs perspective and totally true. Erin gives us a taste of A dogs life, Survivors.....Squeeze OMG I LOVE IT! I thought this book was good because Lucky starts out as a lone dog. Then he finds his sister and joins a pack.Lucky and his pack face many dangers along the way, like poisonous rivers, starvation, a city that is crumbling around them. This book is exciting and is very hard to put down. I absolutely LOVE this book! This is a good book. I like that it includes dogs because often when I was reading the Warriors series by Erin Hunter I always pretended the cats were dogs, now I don't have to pretend. I think the sequel will be good. The only issue with this book is the sudden ending. this should have been a one star book, because basically its about Lucky who walks with his friends. I gave this another star hoping the second book would be better, and because it is by Erin Hunter. I gave it the last star because it had a good ending. Erin Hunter is the pseudonym of five people: Kate Cary, Cherith Baldry, Tui T. Sutherland, Gillian Philip, and Inbali Iserles, as well as editor Victoria Holmes. Together, they write the Warriors series as well as the Seekers and Survivors series. Erin Hunter is working on a new series now called Bravelands. Erin Hunter is inspired by a love of cats and a fascination with the ferocity of the natur Erin Hunter is the pseudonym of five people: Kate Cary, Cherith Baldry, Tui T. Sutherland, Gillian Philip, and Inbali Iserles, as well as editor Victoria Holmes. Together, they write the Warriors series as well as the Seekers and Survivors series. Erin Hunter is working on a new series now called Bravelands.